Georgia Sagri, Hold on to your Ego (stolen song title from...? ), 2011. Forged steel chain, master lock, garbage cans, in "Μοντέλο της Αντιγόνης," at Real Fine Arts, Brooklyn, through May 15, 2011. Photos: 16 Miles. Center: It rained milk yesterday outside the city, 2011. Painted foam core, garbage can lids, chain, milk, leaves, flower petals, granola bar wrapper, dimensions variable. Margins: Detail of Four crosshatches and two lines, 2011. Semi-gloss paint on floor and wall. Google Translate renders "Μοντέλο της Αντιγόνης," the title of Georgia Sagri's recent show at Real Fine Arts, in English, as "Model Julia." However, working one word at a time, it offers "Model of Antigone," which is likely a more accurate rendering since the show's press release includes, in large capital letters, the phrase "ANTIGONEMODELL 1948." That's the name that Bertolt Brecht gave to his version of Sophocles' tragedy, Antigone, which he adapted from a translation of the play by Friedrich Hölderlin. 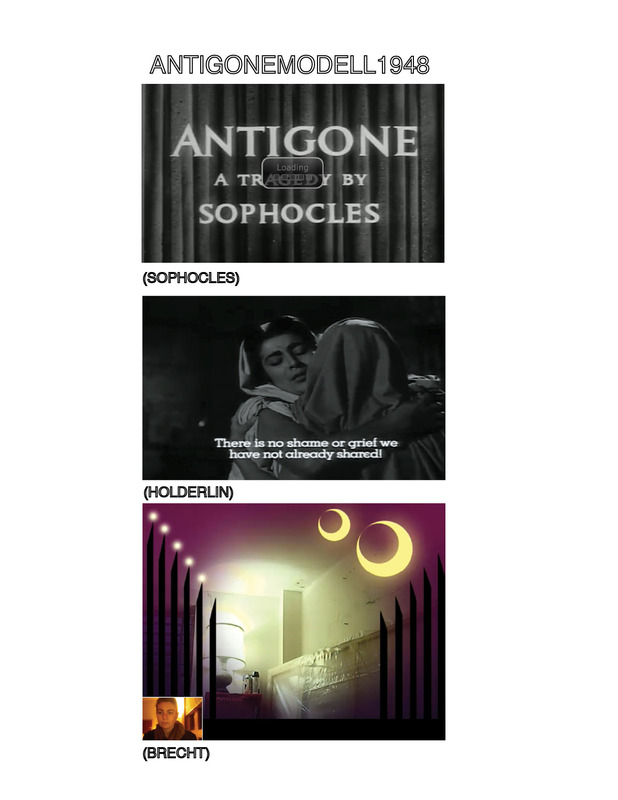 Those three names — Sophocles, Hölderlin, Brecht — are included in the release, too, each situated beneath an image, two of which are identifiable as screenshots from Yorgos Javellas' 1961 film version of the play. (The source of the third is a bit more mysterious.) There is, to put it mildly, a lot going on here. 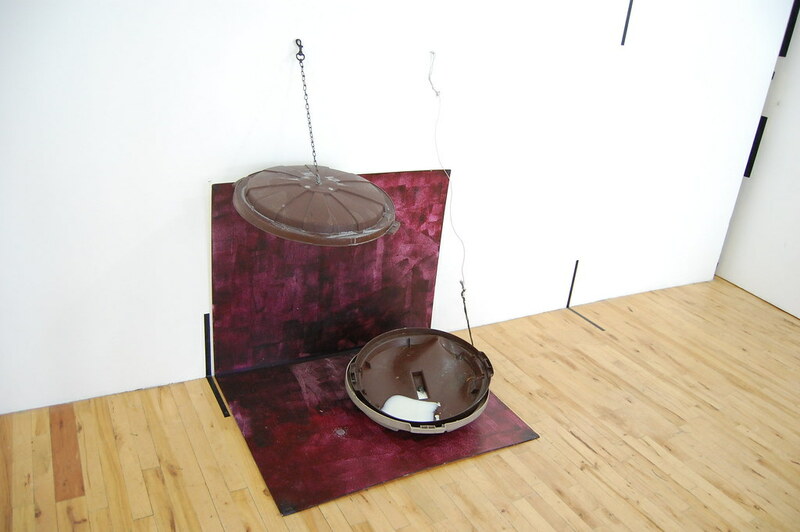 There were garbage can lids inside the gallery — one held in the air by an old grey chain, hovering as if it were covering some phantom can, the others resting on a slice of foam core painted a rich purple, deep burgundy in its densest sections. There was a pool of milk inside one lid, and the checklist promised that leaves, flower petals, and a granola bar wrapper there also there, though I couldn't spot them. Its title is It rained milk yesterday outside the city (2011), and it is one of the most wonderfully strange works of art I have ever seen. Outside the gallery, Sagri offers something of a companion work (or is it the site to It rained...'s non-site? 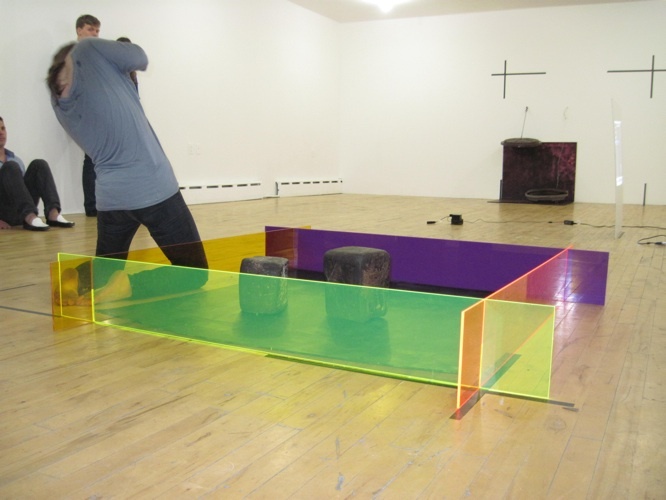 ), wrapping a heavy gold–colored chain around a pair of garbage cans, threading it through a D-ring screwed to the gallery's front stairs and securing the whole contraption with a lock. 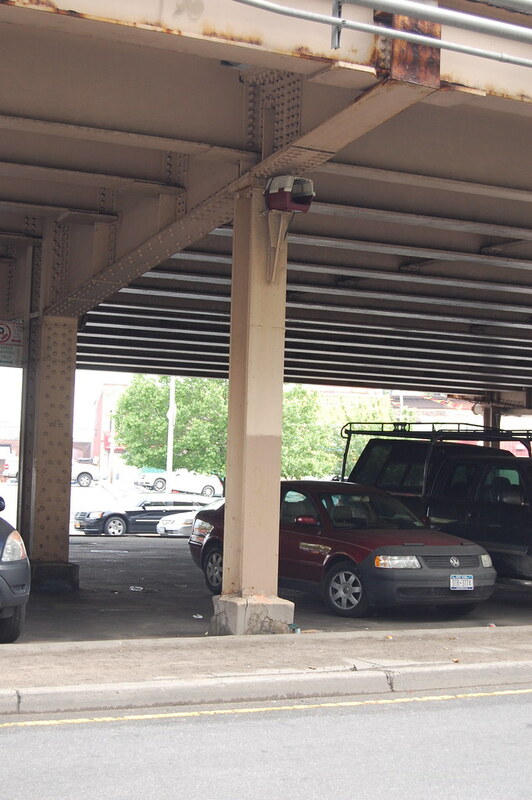 Unethical nests #1, 2011. Blue dog transporter, bungee cord. 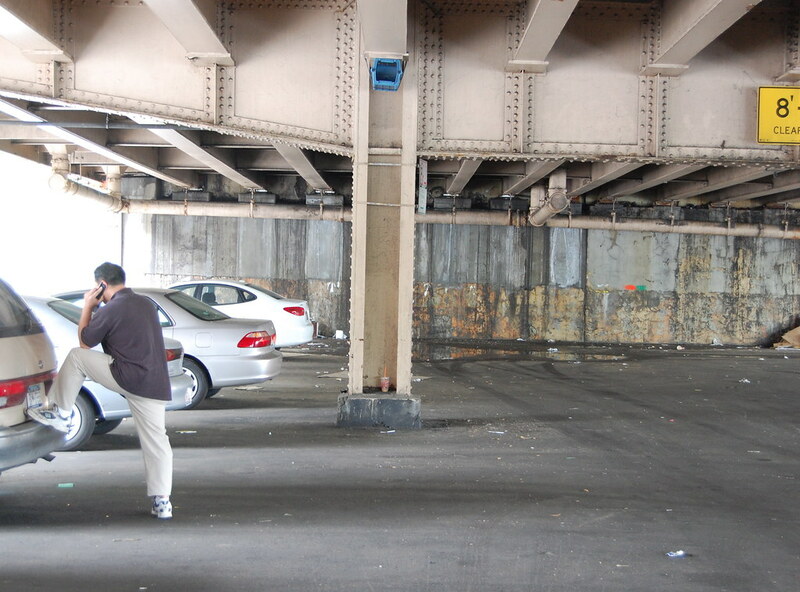 The show spilled out still further into the neighborhood, sneaking up onto the steel beams beneath the Brooklyn-Queens Expressway, where Sagri strapped down three dog transporters without their cage doors and titled each Unethical nests (2011). They easily blended into the surrounding structures, until you spotted them and couldn't believe no one had raised some questions about those strange plastic crates perched high above the ground. They could be concealing security cameras, one might think, or harboring explosives or serving some other devious purpose — harming animals, if one chooses to believe one possible reading of their titles. But they're just sitting there, empty and innocent. What all of this has to do with the Antigone plays — or, for that matter, Antigone, the character, the woman, the shining role model of civil disobedience — is not at all clear. Sagri presented a performance on Thursday, May 12, which I'm embarrassed to say that I missed, so there may have been some clues there. (The estimable Flickr user thefuturistics has photos.) Regardless, she has left us with a set of bewildering objects and situations: a local, homespun site/non-site construction in the form of the two garbage can works, a lofted architectural intervention (with vaguely sinister overtones), and a handful of other peculiarities, including a one-minute PowerPoint show and a modestly sized, jerry-rigged Liam Gillick sculpture. Unethical nests #2, 2011. Brown dog transporter, bungee cord. In an intense interview published in Idiom, Sagri tells Alex Kitnick, "Also I am more interested [in] peripheral actions, the unexpected ones, the hidden when it is exploded, the unreasoning." That's roughly how I think about "Μοντέλο της Αντιγόνης": as a series of strange, quiet, even invisible gestures, and some that seem entirely unreasonable in their flouting of popular reference and easy access. I like what's going on here in an indistinct, unintelligible way, but I can't pretend that I understand it. 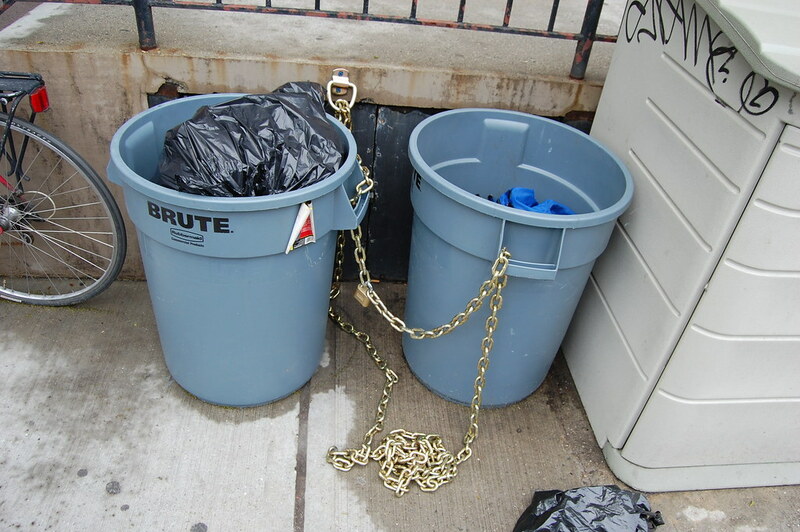 The chained garbage cans, at least, have a clear title: Hold on to your Ego (stolen song title from...?). The answer is the Beach Boys' Pet Sounds, an oblique nod, perhaps, to the dog crates installed across the street. The song title to which Sagri refers, "Hang on to Your Ego," has its own obscure history, having been changed to "I Know There's an Answer" in order to conceal its apparent reference to hallucinogenics. It opens with the lines: "I know so many people who think they can do it alone / They isolate their heads and stay in their safety zones." These are not words that could be sung of Sagri and her myriad, ambitious projects. That said, however filled with potential, the periphery provides its own innate form of safety. I want to know what a Georgia Sagri show would look like in a big, plush contemporary art museum.